I am a long standing fan of Orphan Black but this season they lost me. I tuned in for the opening episode of the new season, and it wasn’t long before my eyes had crossed. In the new season, it feels as if Orphan Black is being made to labor under the weight of its own complexities. And with all the clones in motion, these complexities are formidable. And with two seasons in place, there are many additional plot points and precedents to honor. Tedium, thy name is consistency. Showrunners Graeme Manson, Ivan Schneeberg and David Fortier must of course honor the story. Fans, especially, are ferocious in their defense of its integrity. But the rest of us really are not engaged in narrative book-keeping in any kind. We love the actress, her clones, and the broad story lines that give her an opportunity to dazzle us with her virtuosity, lend some urgency to the story at hand, identify the goodies and the baddies, and that’s enough for us. We want some sense of narrative development. We want our heroine to mature or at least change (or at least clone) as pluckily she survives. But give us the big picture, not what feel like pages of gawky exposition in which good actors are brought low by the need to belabor plot points. These moments almost feel like writers and directors clarifying story complexities for their own sake, and when this happens we know that undue complexity has hijacked the show. Narrative captivity, it’s a terrible thing. We see why this happens. After a couple of seasons, the people who make the show have mastered the finest plot points better than the best Yeshiva student. And fans! Fans live and breathe the show and they often appoint themselves the guardians of the story line. (“You want me on the wall. You need me on that wall.”) And in a sense this is like any corporate culture, where the incumbents fall into a gravitational field and eventually can’t believe that everyone doesn’t live there too. There are a couple of ways of fixing this. One is to have an ethnographic panel of half-fans. These are people who love the show but live in distant orbit around it. They know the characters and the major plot points, but they don’t know or care about the very fine details. Writers, directors and show runners can call them up from time to time and say, “So tell me about the show” and they can use this as a chance to recalibrate. It’s a question of optics. We can hold up the half-fan’s view of the story and change the way we see the show. Or think of it as a time machine. We can use the half fans knowledge of the show to recover the way we understood it in the first season. Naturally, half fans, some of them anyhow, will evolve into full fans. And it will be up to the person running the panel to replace them with more half fans. In fact we should think of the panel as a bend in the river, a place where half fans slow for long enough for us to quiz them…before they run downstream to full fan status. I don’t know who want to take this on. And it would be presumptuous to suggest a name. So I will. Dee Dee Gordon could do this brilliantly. What we need, Dee Dee, is a panel of half fans. As someone starts a new show, they will ask you to empanel this panel, and from time to time they will use it to see their shows (as many, most) others do. In effect, the half fan panel (now, HFP, because that sounds way more official) is a rope that the showrunner wears around his/her waist while descending into the narrative mine shaft. A couple of sharp tugs and they can return to the surface. This entry was posted in Uncategorized and tagged BBC America, brands, corporate culture, David Fortier, Dee Dee Gordon, fans, Graeme Manson, half fan, half-fans, Ivan Schneeberg, narrative captivity, narrative complexity, narratives, Orphan Black, showrunners, TV on April 21, 2015 by Grant. Here’s one slide that people seemed to find useful. The idea was to show trends in motion. The events picked out in blue represented the pre-artisanal era, the period in which we liked our food fully industrial and the more artificial the better. Then the reaction, the repudiation, of artisanal food begins with the counter culture and the emergence of the person who was to be the goddess of the new movement, Alice Waters and her restaurant Chez Panisse, the one that was to prove the beachhead of the new movement. Waters and CP brought a new idea into the world and then sent a diaspora of chefs and enthusiasts who went out into the world to colonize it in the name of the artisanal. If you are interested in attending the Culture Camp, please let me know at grant27ATgmailDOTcom. The next one will be in New York City possibly in the late summer. 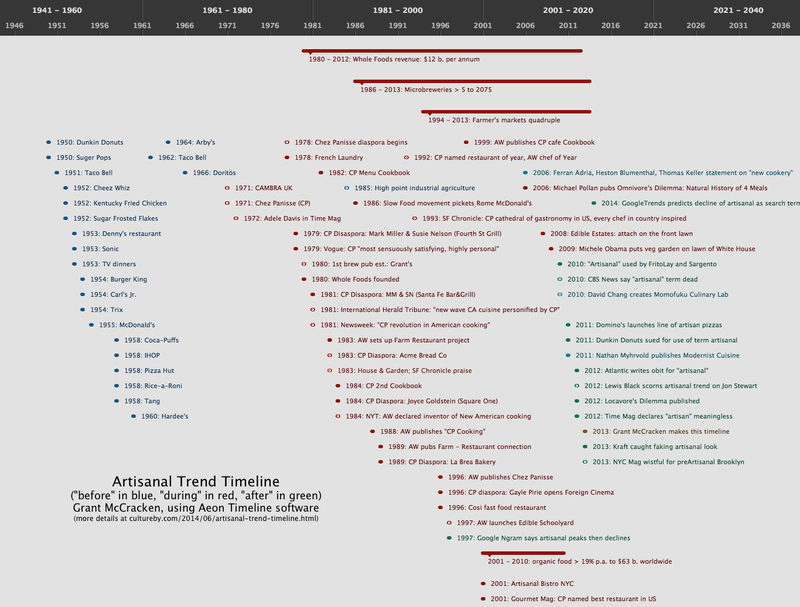 If you want a high rez version of this slide, send me an email at the same address. This entry was posted in Uncategorized and tagged 1950s, Aeon, Alice Waters, artisanal, artisanal trends, brands, Chez Panisse, Culture Camp, fast food, food, food culture, planners, pre-artisanal, prepared food, strategists, strategy, timelines, trends on June 18, 2014 by Grant. I did a talk today for Susan Fournier’s Boston University conference called Brands and Brand Relationships. It was illuminating, forcing me to see things I didn’t know I thought. This entry was posted in Uncategorized and tagged Boston University, brands, Susan Fournier on May 21, 2014 by Grant. Stephen Colbert replaces David Letterman. Please help us figure out what this means! This just in. 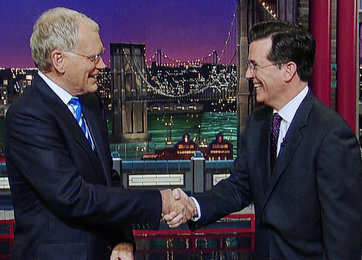 We learned moments ago that Stephen Colbert will replace David Letterman on late night television. We can identify the cultural significance of David Letterman . He came to prominence on the back of a cultural trend, the Preppie revolution. Letterman was the guy who liked to stand in a window in Rockefeller Center and proclaim through a bull-horn, “I’m not wearing any pants.” This was preppie humor, a frat boy prank. Below is my cheat-sheet treatment of the Preppie revolution as it appeared in Chief Culture Officer. I would love it if people would give offer a brief account of the cultural movement that brought Stephen Colbert to prominence and the shift in culture his rise represents for us. Don’t feel obliged to give a detailed account. We can make this collaborative. Just take a different piece of the puzzle and I will try to piece together when all “results” are in. The preppie convergence began to form visibly and publicly around 1980, but we if we were astoundingly well informed and gifted, we could have seen it coming ten years before. Doug Kenney founded in National Lampoon in 1970 with staff from the Harvard Lampoon. And we could have tracked the success of this convergence as this publication began to scale up. National Lampoon published parodies of Newsweek and Life, the 1964 High School Yearbook Parody (1974), and a well received issue entitled Buy this magazine, or we’ll shoot this dog. By the end of the 1970s, Lampoon circulation had reached nearly a million copies per month. And by this time even the dimmest trend hunter had it on their radar. Sales is one thing. We should also be alert to the migration of talent. In the case of the preppie convergence, we needed to be paying attention when the world started raiding the Lampoon for talent. Kenney left to write movies. Michael O’Donoghue left in 1975 to become head writer for Saturday Night Live. P.J. O’Rourke left to write for Rolling Stone. The National Lampoon spoke with the voice of the ruthless private school boy. Apparently this was now in demand. Everyday language began to vibrate with new phrases: “go for it,” “get a life,” “get a grip,” “snap out of it.” It was easy to see how these spoke for the new convergence. People were impatient with the old pieties. That was 60s idealism, and people were done with that. Convergences must shake the webs of the publishing world. (Or they cannot be convergences.) One of the best sellers of the period was Lisa Birnbach’s The Preppy Handbook in 1980. This was 200 pages of detailed instruction: what to wear, where to go to school, what sports to play, what sports to watch, what slang to speak, how to be rude to a salesperson, and how to mix a Bloody Mary. If the National Lampoon had supplied the new character of the decade, here were instructions of a much more detailed kind. The consensus was visible in public life. Suddenly Harvard Yard, never especially presentable in its architecture, appointments, or personnel, filled with glossy teens in down vests, Norwegian sweaters, and Top-Siders, all newly minted by L.L. Bean. Some of them were the children of Old Money following ancestral footsteps into the Ivy League. But most were kids from Boston University who believed that the Yard was a better lifestyle accessory. The convergence began to recruit ferociously. A young woman remembers. The tide turned again. Repudiation was coming. We might have seen, as I did, graffiti on a Tom Cruise movie poster that read, “die Yuppie scum.” Another was Gordon Gecko in Wall Street (1987), a film Roger Ebert hailed as a “radical critique of the capitalist trading mentality.” The prep hero was now tarnished. (Life soon imitated art, with the fall of Michael Milken, the junk bond trader indicted in 1989 for violations of federal securities and racketeering laws.) The third was the movie, Heathers (1989) in which teens excluded by snobbery take a terrible revenge against the preps. The fourth was the publication of American Psycho in 1991. This was, among other things, a vilification of the prep. At this point, the big board should be flashing with warning signals. Something new had made it up out of the college campuses of the world, past all the little gates, and on to the big screen. Pity us if this is our first warning. I was doing research with teens in 1990 and, almost to a person, they were saying, “well, I guess you could say I’m a Prep, but I don’t really think I am.” Or, more forcefully, “The last thing I want to be called is a Prep.” This was coming from kids who were still wearing buttoned down shirts and Top Siders. Teens were moving on, some to the emerging subculture of rap, some to a brief revival of the hippy regime, still others were taking an “alternative” turn. We do not have access to this data, but we can assume that sales figures for Ralph Lauren, Rolex, BMW, and the other “flag ship” brands of the decade fell sharply. Presumably, furniture and textile stores suddenly found it difficult to move their “duck” and “sailboat” motifs. What convergences give, they take away. 1 Stroh, Ann. n.d. The Preppy Handbook and other myths. This document may be found at http://www.sit.wisc.edu/%7Exanadu/preppy_handbook.html. 2 For the connection between the prep or yuppie movement and BMW, see Greyser, Stephen and Wendy Schille. 1991. BMW: The Ultimate Driving Machine Seeks to De-Yuppify Itself. Harvard Case Study, 9-593-046, December 27, 1993. Steven Greyser is an Emeritus Professor at the Harvard Business School. Wendy Schille was a research associate at HBS at the writing of this case. This entry was posted in Uncategorized and tagged Alex P Keaton, Animal House, BMW, brands, Caddyshack, Chief Culture Officers, cultural trends, culture, David Letterman, Doug Kenney, duck motif, frat boy, Harvard Lampoon, Heathers, J.Crew, L.L. Bean, Land's End, Lisa Birnbach, Michael J. Fox, Michael O'Donoghue, National Lampoon, P.J. O'Rourke, preps, Ralph Lauen, Rolex, Rolling Stone, sailboat motifs, Stephen Colbert, The Preppie Handbook, the preppie movement, the preppie revolution, Tom Hanks, Top Siders, Wall Street on April 10, 2014 by Grant. 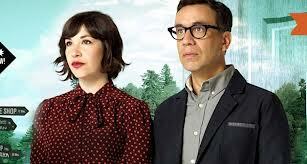 This entry was posted in Uncategorized and tagged branding, brands, Carrie Brownstein, Fred Armisen, HBR, Portlandia, satire, Subaru on January 26, 2013 by Grant. Please have a look at my recent Harvard Business Review post. It looks at the evolution of the brand creature. This image is Sparah, the brand creature created by Virgin Mobile. There is something brewing here. This entry was posted in Uncategorized and tagged brand, brand characters, brand icons, branding, brands, Grant McCracken, Harvard Business Review on August 9, 2012 by Grant. Pizza boxes: the new trojan horse? 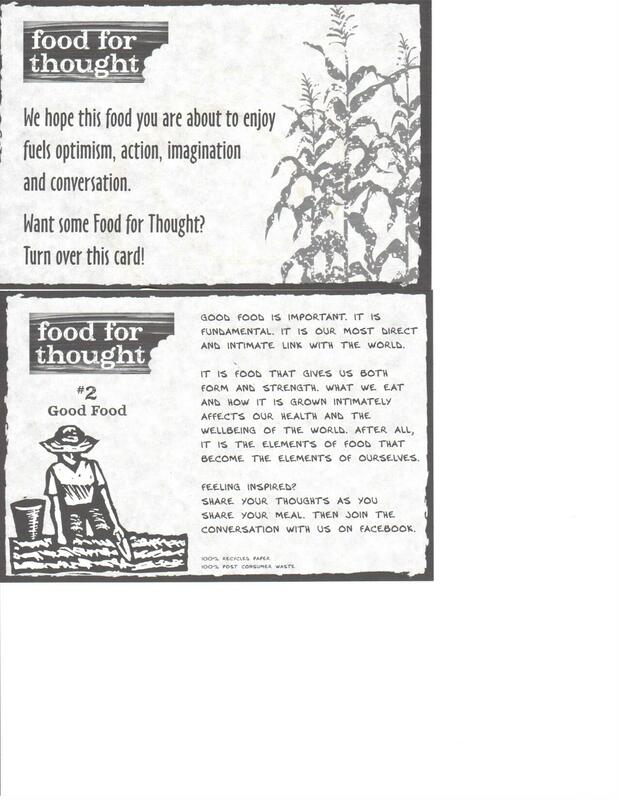 Have a look at this “Food for thought” card, please. There it is at the bottom of the screen. It appeared recently with my store-bought pizza. But there is something unseemly about being instructed in this sort of thing by a brand. There is presumption of familiarity. For the brand to speak to me in this tone means that the brand must know me. There is also a presumption of asymmetry. In our relationship, the brand knows better. Finally, there is that recitation of the new cosmology: that stuff about food connecting us to the world. I agree with everything being said (give or take). But I am a little uncomfortable when these things are being said to me…by a brand. Unless of course there really is a new orthodoxy and certain powers are entitled to recite this orthodoxy and the rest of us are obliged to listen to it. And if that’s the case, someone forgot to tell me. Apparently, I missed that box. This entry was posted in Uncategorized and tagged branding, brands, orthodoxy, pizza on April 25, 2011 by Grant. I am not a gifted conversationalist. I carry on every conversation as if it were bomb disposal. One false move. One stray remark. And it’s all going to end in free fall. This must be why I’ve always thought that social actors should have a "prompter" the way actor actors do. You know, for those awful moments when we don’t know what to say. The prompter would, er, prompt us. "Say ‘I love your dress.’ No, dress!" You often see people who have run out of things to say. Or you see people who have been driven back on the cliches. Yesterday, thanks to fresh ethnographic wedding data from Tim Sullivan, I was tweeting about "Woo girls." These people are really running on empty. They are defined (perhaps unfairly) be the predictability of the things they say and the sounds they make. Indeed, these women are now the targets of TV satire. These women really need prompting. Bar tenders are astoundingly good at creating and managing conversation. It is an unofficial part of their job description. I have sat with lots of them as they told me how they can see a twosome or a party of 4 coming undone. Their job is to intervene and reanimate the conversation. They supply this service so routinely we might as well call them emergency personnel standing by. I’ve always felt that brands could and should get in on the act. After all, they are often keenly interested in the outcome of the event in question. Carbonated soft drinks are largely about making the effervescence of the product the effervescence of the event. Successful social events are good for the brand. The Coke brand is well served when things go better with Coke. I have pitched more than one client on the idea that we could use cell phones to drop conversational prompts into social situations. If people wanted to, they could sign up for text messages and they could then speak the message that appeared on their phone. It would by funny and fun, and it would remove chuckleheads from harm’s way. 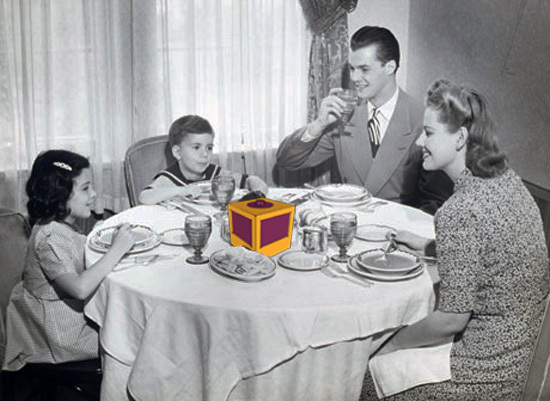 The Conversacube is a small box meant to form the centerpiece of any conversation situation. The box sits in the middle of all conversants, with one face facing each person. Each outward face of the box has a small screen and a microphone embedded just inside. As the conversation progresses, each person is personally prompted with directions or lines to keep the conversation running seamlessly with minimal awkward or uncomfortable moments. The microphones monitor audio levels of each participant and the cube responds accordingly, adjusting prompts to enliven, mediate conflict, or balance conversation as necessary. Brilliant or what? Marketers, start your engines. This entry was posted in Uncategorized and tagged branding, brands, carbonated soft drinks, Conversacube, conversation, Lauren McCarthy, Tim Sullivan, Woo girls on October 20, 2010 by Grant. I was talking to a smart marketing guy in San Jose and we were talking about how to craft brands in the Cluetrain era, now that we can’t shout at the consumer until they "get it." Most of the properties being created in the social media space are haunted by a problem. They are designed to be companionable and interesting. They are intended to be something the consumer will like well enough to repurpose for their own purposes. When this, being companionable and being useful, is the condition of entry, we know that we can not honk the brand horn loudly. Indeed it’s not even clear we can mention it in anything more than a whisper. Anything more forthcoming makes us conspicuous and the marketing property disagreeable and distinctly not the kind of thing the consumer wishes to distribute through their own networks, under their own names, as it were. The solution I personally love is putting virtual worlds on line. I love the idea of building a world that people can discover and examine and perhaps inhabit. It should be beautiful, filled not with puzzles or violence, but with subtle little clues that allows the visitor to glimpse and then by dint of their own imaginations complete. The Sophie project I did at the Coca-Cola company was designed to work this way. We created the home of a creature who was half goddess, half teenage girl. The visitor wouldn’t actually ever meet Sophie. But there was lots of evidence with which to understand who she was and how she acted in and on the world. Someone stormed in and turned the thing into a TV show, or tried to, and that was the end of that. But Sophie lives on. These worlds are rich, participative, cocreative, mansions within mansions. In a world this rich and this generous, the brand can make the occasion appearance, garner recognition, extract, dare I use this word, marketing value, and then make itself scarce. When there is something much going on, when the world in question is so fabulously endowed with imaginative resources, the brand couldn’t "barge in" if it wanted to. I would love to hear from readers about virtual worlds that might quality. I haven’t ever seen a Second Life that seemed to fit the bill. 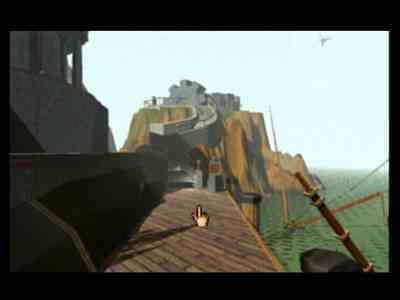 I loved the atmospherics of Blade Runner and the beauty of Myst. I like the endless nooks and crannies of GTA. But none of these ends up a world that feels endless interesting and explorable. But then I don’t get out much. Please if you know good cases in point, sing out. 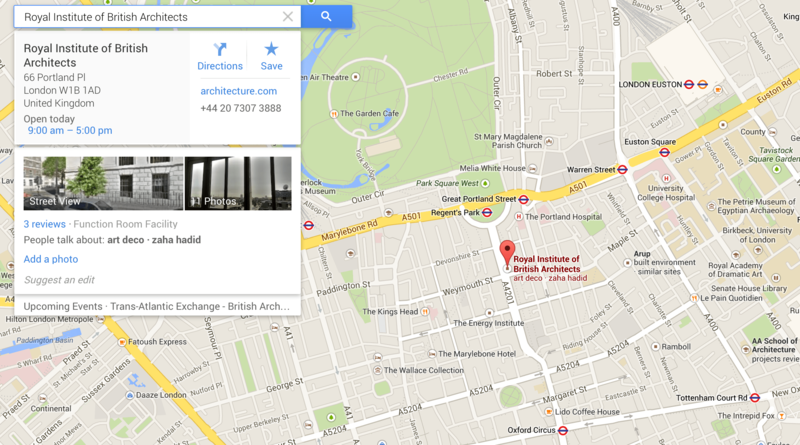 This entry was posted in Uncategorized and tagged branding, brands, virtual worlds on July 2, 2010 by Grant.